As I was tidying my kitchen bench this morning I noticed a message printed on the back of a supermarket docket. The shape of a strawberry caught my eye so I glanced at it just before I crumpled it up in my hand to throw it away. I paused briefly to absorb this piece of trivia and then carried on to my next job which was to ring a friend, Gloria. Minutes later, transported miles away from mundane kitchen tasks, we were discussing the wonderful concept of building our communities totally based around the needs of children, rather than adults. We mused about how the whole environment would be so different to how we build communities at present and how this would benefit all of humanity, to be able to live safely, joyfully, harmoniously. The word ‘safely’ especially struck a chord as we talked about communities collectively raising children in a spirit of Unity Consciousness. With this vision of Utopia building in my mind I suddenly thought of the strawberry and exclaimed to Gloria “Yes! Imagine creating such environments where we didn’t feel we have to ‘hot- house’ children for their own safety, but instead felt as confident as the strawberry who boldly carries her seeds on the outer of her body, such is her trust in her environment! Imagine living within a paradigm of Peace, Love and Oneness as children naturally do. Imagine seeing the world through the eyes of children and then reflecting this delightful world in our architecture, education, parenting, agriculture and so on. The strawberry obviously considers herself to already be living in this world of Peace, Love and Oneness. Otherwise, wouldn’t she be protecting the seeds of potential future generations deep within her belly as other fruit do? She seems to have ignored the dire warnings of lack, darkness, despair, violence and instead, has created a rich, plump, luscious, glossy, juicy expression; one that epitomizes abundance, joy, light, expectancy, celebration. Even her shape resembles a heart somewhat. And as for her little frilly green hat, well, that’s just pure playfulness! 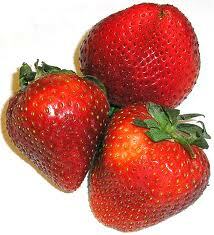 Perhaps, like me, you eagerly look forwards to seeing strawberries appearing in your shops and home gardens. They trumpet in the summer with their riotous red colour and tiny golden seeds so cleverly tucked just inside their colourful skirts. In New Zealand we often bake delicious deserts called ‘Pavlova’ for any celebration (especially our summery Christmas deserts) and delight in decorating the top with masses of these bright, cheerful berries., joy, light, expectancy and celebration all in One! With a little care from another who places straw around her nesting area, she is even protected from splashes of dirt and her room temperature is kept comfy at the same time. And when her season has passed she gracefully surrenders her vines to the new generation to carry on the following year. Meanwhile she has taken ample opportunity to spread her abundance and joy by spreading her vines and tendrils out to reach all in her environment. Having brought this expanded awareness of this beautiful berry into the light of my consciousness I now feel more aligned to the strawberry than to the kiwifruit, which New Zealanders are widely associated with. (Overseas, we are even called ‘Kiwis.’) After all, the kiwifruit is a fuzzy, dull, brown fruit; that is, until one peels off this deceptive layer of dullness! For lying quietly underneath the dross of brown fuzz is an electrifying green, luscious, juicy fruit, resplendent with white radials and black seeds making stunning patterns. How easy it would be to overlook the humble kiwifruit next to the dynamic strawberry. And the kiwifruit equally takes its place on top of many a Pavlova, it is true. Now, I’m in a quandary! Am I more aligned with the showy strawberry who offers all she has at first glance- or am I more attuned to the modest kiwifruit whose inner depths must be discovered with a little effort involved? If I look at the consciousness of the kiwifruit I see a beautiful inner fruit which seems to feel it needs to protect itself with a slightly prickly skin, of a colour which doesn’t attract too much attention from predators. Aha! Is it possible the kiwifruit is still trapped by beliefs of the old paradigms of aggression, fear and separation? Poor kiwifruit! I invite it to shed its conditioned skin of protection and to experience the liberation of living in Peace, Love and Oneness. At the risk of being called unpatriotic, my vote goes to the strawberry! Oh, no! Now I’ve made a judgement, and caused a separation… and that is not part of the concept of Oneness! I know! I’ll put both fruits on top of the Pavlova and hope that the kiwifruit will be inspired by how good it feels, wallowing in thick cream, feeling the silkiness against its flesh. Maybe it will begin to remember who it really is, without the constraints and limitations of its fuzzy, brown down. And with the strawberry there alongside, I’m sure it will awaken to the endless possibilities of experiencing life without its old skin. Have you shed your fuzzy, brown skin as you create your New Year?